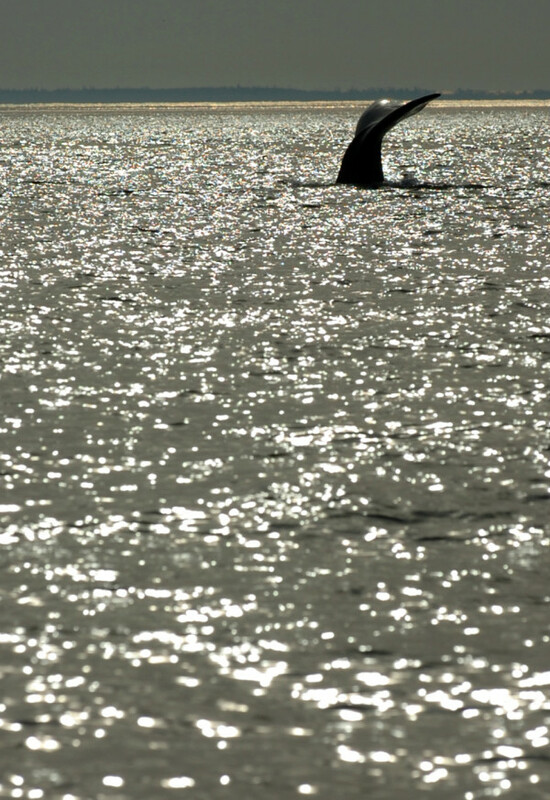 A North Atlantic right whale shows its fluke as it dives in the Bay of Fundy in August 2009. 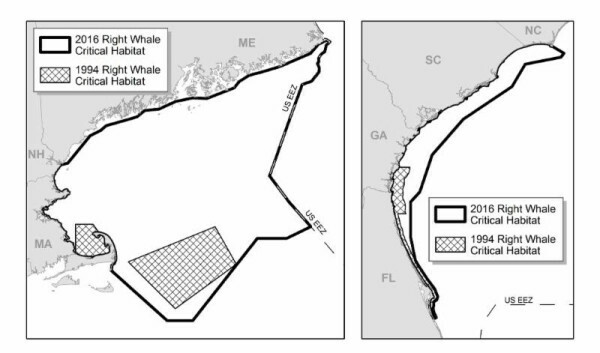 These graphics provided by the National Oceanic and Atmospheric Administration compare 1994 critical habitat designations for right whales in the Atlantic Ocean to new protection areas taking effect near the end of February 2016. Researchers with New England Aquarium saw more than 40 North Atlantic right whales on Aug. 13, 2009, in a 35-square-mile area of the Bay of Fundy, including this one near sunset. 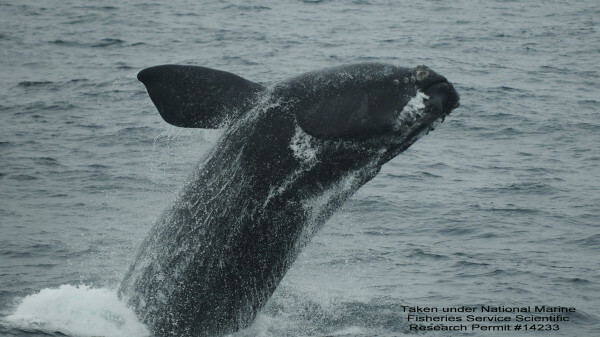 A North Atlantic right whale breaches on Nov. 16, 2010, in Jordan Basin in the Gulf of Maine. Over the past 35 years, the population of right whales in the North Atlantic Ocean has not expanded nearly as much as scientific understanding of the endangered species. In February, acting on data compiled in recent decades, federal regulators will greatly expand the marine mammals’ designated critical habitat areas off southern and northern portions of the East Coast in the hope the whales’ population numbers might follow suit. Only 500 or so right whales are estimated to exist in the North Atlantic, up from an estimate of 300 in the mid-1990s, according to federal officials. In New England, the expanded critical habitat area will include all American waters in the Gulf of Maine. 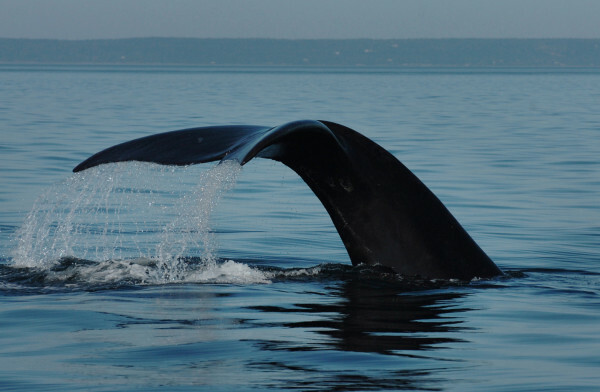 Previously, the right whales’ designated critical habitat in the region included only Cape Cod Bay and a larger area just north of the Great South Channel between Cape Cod and Georges Bank. In a statement released Jan. 26, officials with the federal National Oceanic and Atmospheric Administration indicated that the expansion of designated critical habitat for right whales won’t place any additional burdens on commercial fishermen. It will require other federal agencies that conduct, fund or permit activities in the expanded areas — or entities that seek federal funding or permits from those other agencies — to work with NOAA fisheries regulators to minimize impacts in the expanded areas. The final rule, which goes into effect near the end of February, “does not include any new restrictions or management measures for commercial fishing operations,” NOAA officials wrote in the release. Regulations aimed at preventing right whales from getting entangled in fishing lines have been a sore point for Maine lobstermen who claim that gear configuration rules implemented over the past decade have hurt their bottom lines. The offshore fishing requirements to use expensive sinking rope and to limit the number of vertical buoy lines they deploy have resulted in higher recurring equipment costs and an increased loss rate for traps that get snagged on the ocean bottom, many have said. Whale advocates and researchers counter that the restrictions are necessary because the vast majority of right whales in the North Atlantic — as many as 75 percent — have scars from having been entangled with ropes at some point in their lives. The expanded habitat designation could have direct implications for any wind developers or aquaculture operators who may apply for federal permits to work offshore in the Gulf of Maine, NOAA spokeswoman Jennifer Goebel said Friday. The change means the U.S. Department of Energy or Coast Guard, for example, and entities seeking funding or permits from those agencies would have to closely consult with NOAA about the effects their projects could have on right whales, she said. Goebel said the expanded habitat designation is a result of a petition to take action the agency received in 2009 from wildlife conservation groups Defenders of Wildlife, Humane Society of the United States, Center for Biological Diversity, Whale and Dolphin Conservation, and Ocean Conservancy. Population distribution surveys and studies on the whales’ eating habits in the Gulf of Maine and Bay of Fundy over the years have revealed winter concentrations of whales that previously had gone undetected. For a long time, researchers did not know where right whales went in the colder months, but the results of relatively recent aerial and boat-based surveys indicate the Jordan Basin, Cashes Ledge and Jeffreys Ledge areas could be wintertime mating grounds. Along the coast in the South, where pregnant right whales give birth in the winter, the expanded critical habitat area will stretch from Cape Canaveral in Florida to Bald Head Island in North Carolina and, for most of that distance, will extend roughly 50 miles out from shore. Previously, the designated area was between Cape Canaveral and the mid-Georgia coast and extended approximately between only a dozen or two dozen miles out to sea. In a separate statement released this week, Defenders of Wildlife said the expanded habitat is “great news,” but that the transit corridor along the East Coast between the two areas also should be considered critical habitat. Patrice McCarron of the Maine Lobstermen’s Association, the largest commercial fishing industry organization in the state, said Friday that, taken at face value, the expanded habitat designation does not appear to have any direct negative impacts on fishermen. More than that, she said, fishermen in general are in favor of helping to protect the marine environment in the Gulf of Maine. Past history shows that third-party groups use federal rules and designations to push new restrictions on fishermen, McCarron noted. The sinking groundline requirement the federal government enacted in 2009 was the result of a 2007 lawsuit the Ocean Conservancy and Humane Society of the United States filed against NOAA that accused the agency of not living up to the requirements of federal right whale conservation laws. McCarron said lobstermen are worried the expanded habitat designation could turn out to be a stepping stone to more lawsuits or even more stringent fishing restrictions down the road. Ship strikes also have been a significant contributor to mortality rates for right whales, which have an estimated top swimming speed of less than 6 mph. In the fall of 2003, because of an annual seasonal concentration of right whales east of the Canadian island of Grand Manan, the main shipping lane that funnels large ship traffic between the Gulf of Maine and the Bay of Fundy was shifted east toward Nova Scotia, away from where the whales tend to be found. Whale researchers also have been providing the bay’s shipping traffic controllers with information about the location of whales in the area, which then is passed on to the ships so they can know where the animals might be. In 2007, shipping lanes in and out of Boston Harbor were narrowed and moved to the north to reduce the risk of fatal ship strikes for right whales.